TULALIP — From the deck of a 30-foot research boat owned by the Tulalip Tribes, Terry Williams pointed out the remnants of a bulkhead along Mission Beach where not long ago there was a string of beach houses. In 2013, the leases on the tribal property weren’t renewed and the homes were removed. The main concern was erosion of the beach and the bluffs overhead damaging the fragile marine environment below. 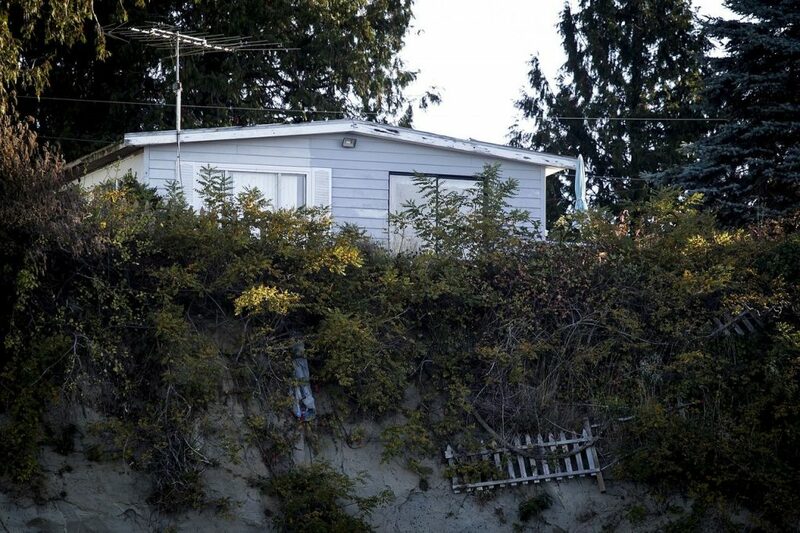 Williams, who is the Tulalips’ treaty rights commissioner, said increased rainfall and stronger windstorms would saturate the sandy bluffs and cause them to slide down onto the houses below. “It gets to the consistency of a milkshake and tends to fall,” Williams said. On a bright fall day, several parts of the bluff showed clear evidence of slides. Houses were visible above. 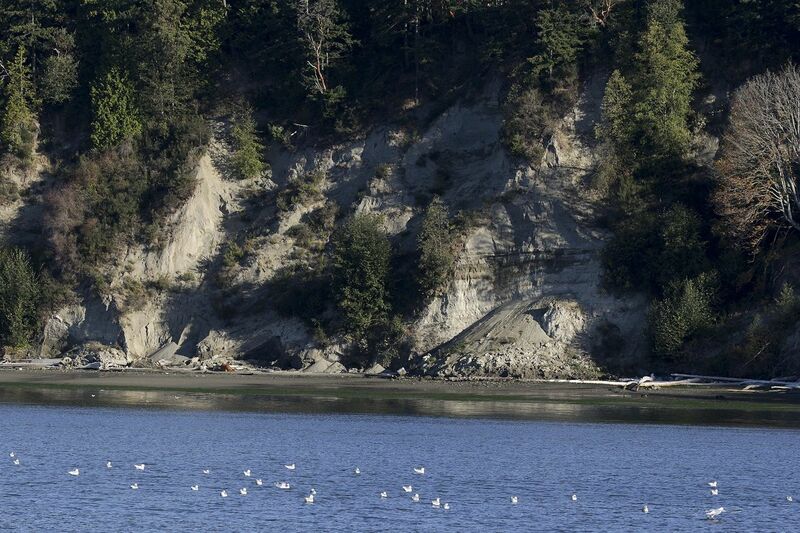 Coastal landslides tend to silt up the nearshore environment, which is considered a critical piece of the salmon ecosystem. “Those areas are really important for forage fish for threatened and endangered salmon,” said Joshua Meidav, the Tulalip Tribes’ conservation science program manager. The beaches were created and rejuvenated over millennia by the gradual erosion of the bluffs. Development along the shore, including bulkheads, docks and clifftop homes, interrupted that natural process. Now when the bluff slides, it tends to come down all at once, Williams said. “The reality is that this is all changing,” he said. Climate change is a concern to Williams and the Tulalips in ways that go well beyond the usual worries about flooding and slides. It’s an issue of treaty rights. While treaty rights are most commonly understood in the context of dividing the salmon harvest, their reach extends beyond the fishing grounds to tribal relationships with local, state and federal governments, said Ray Fryberg Sr., the Tulalips’ Executive Director of Natural Resources. Most commonly that manifests in cooperative work with federal, state and local governments, and even private landowners, on many kinds of projects designed to restore salmon habitat. On other occasions, the tribes have sought redress in the federal courts when they felt government wasn’t living up to its obligations. In 2001, 21 tribes argued successfully that Washington state violated their treaty rights because culverts that carried streams under roads harmed salmon runs. The 9th U.S. Circuit Court of Appeals upheld that decision in June, and ordered the state Department of Transportation to replace or fix 818 culverts at an estimated cost of $2.4 billion over the next 17 years. It was a significant advancement of treaty rights into the realm of habitat restoration. “The culvert case is the case that says there has to be a restoration so that ongoing harm doesn’t continue,” said Robert Anderson, a law professor and the director of the Native American Law Center at the University of Washington. In this case, the state of Washington was found to have damaged habitat for salmon, and was ordered to make repairs. Habitat protection and restoration were key elements in the second phase of a landmark decision by U.S. District Court Judge George Boldt. In 1974, the first phase of the Boldt decision provided the basis for the co-management system, in which tribal and non-tribal fishermen divide the salmon harvest each year. The second phase, decided in 1984, focused on the habitat for the salmon. The part of the Phase II Boldt decision that obligated the federal government to restore habitat was overturned on appeal. However, the federal appeals court still said that the state of Washington and the tribes needed to take steps to protect and enhance the fisheries. What those steps should be was left unstated. “It’s difficult to argue that the federal government has an obligation to restore the ecosystem to, say, pre-treaty conditions, or treaty-time conditions,” Anderson said. Some of the damage to habitat had already been done by that time, he said. Also, it’s a lot harder to assess the damage done by small changes, such as a single tide gate on private land, compared with the cumulative effects of the state’s culvert construction. Momentum for restoration work can be created, however, when treaty rights are considered in tandem with the Endangered Species Act’s listing of various populations of salmon and steelhead. In practical terms, that means that the tribes have been aggressive in forming partnerships to pursue environmental projects. Representatives from the Tulalips and the Suquamish Tribes were included in last week’s announcement of a new governmental task force to identify goals to protect Puget Sound. Tribes also have broad leeway to take on projects of their own that help restore habitat, or at least halt the progress of degradation. It’s not a blanket authority to do anything anywhere, but it means tribes have a seat at the table whenever a treaty trust resource is affected. As a coordinating body among the 20 treaty tribes of Western Washington, the Northwest Indian Fisheries Commission has a role supporting restoration programs to have a greater impact. A lot of the commission’s work focuses on the marine nearshore environment, said Fran Wilshusen, the NWIFC’s habitat services director. That also means studying how the marine environment interacts with estuaries, river systems and the upland watersheds. “We’re trying to pull the lens back and look at how the whole system is connected,” Wilshusen said. That includes small projects, such as the Tulalips’ 2013 pilot study to release beavers in the western Cascades, where their activity of building dams is expected to help return the upper reaches of streams to their natural state, which happens to be better spawning territory for salmon. Larger efforts include the Tulalips’ restoration of the 400-acre Qwuloolt Estuary in Marysville. A similar project was restoration of the 762-acre estuary in the Nisqually National Wildlife Refuge outside Tacoma by the Nisqually Tribe. The ongoing Nearshore Restoration Project focuses on restoring beaches and marine environments damaged by beach erosion. It’s a Snohomish County project, and local tribes have a place at the table, serving on the boards of several organizations that provided money for the project, including the county’s Marine Resource Committee and the Northwest Straits Commission. One project under way is an agreement between the Tulalip Tribes and the U.S. Forest Service to maintain a 1,280-acre tract in the Mount Baker-Snoqualmie National Forest as a source of wild huckleberries. There aren’t that many places left in the mountains that are accessible by road that still provide habitat for the berries, which are important to tribal culture, said Libby Halpin Nelson, a senior environmental policy analyst with the Tulalips. “They are healthy and they are a traditional food that is always looked for in ceremonies,” Nelson said. The project includes removing small conifers that could “shade-out” the berries. In essence, the tribe is mimicking the effect forest fires used to have before fire suppression became standard response, she said. For all the work that’s been done to protect and restore salmon habitat, the fish runs continue to decline. In spring, projections of low numbers of returning salmon, especially coho, led to a breakdown of negotiations between the tribes and the state. Tempers flared and fishermen protested when tribes were given permission to catch a small number of spring Chinook while the non-native sportsmen had to wait. A July report from the Northwest Indian Fisheries Commission’s “Treaty Rights at Risk” initiative pointed out just how dire the situation was for many watersheds, including the Snohomish and Stillaguamish rivers: Habitat was being lost faster than it could be replaced and nearly every single indicator of the health of salmon populations was trending downward. The challenges looming on the horizon are even more formidable. With each new study, it becomes clearer that changes are elapsing at an increasing speed. “Ten, 15 years ago, what we said would happen in 50 years is already happening,” Fryberg said. The Tulalip Tribes hosted two summits this year, one in April concerning rising sea levels, and another in September that looked at adapting to climate change in general. 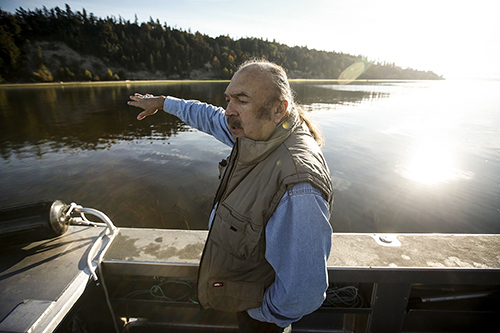 Fryberg said the tribe is planning a third focused on the state of salmon recovery. Williams’ entire career has been focused on building bridges between tribal, state and federal governments. Shortly after the Boldt decision, he was involved in setting up the co-management regime in the state, and then negotiating the Pacific Salmon Treaty with Canada and its First Nations, backed by research developed by Tulalip staff scientists. In the 1990s he was tapped to open the Indian Office in the Environmental Protection Agency. But many efforts to restore salmon runs were coming up short. “We were putting tremendous amount of money into restoration and we were losing ground,” Williams said. He realized that many federal and state agencies operated in their own silos, and often they might set regulations that aren’t in line with each other or broader goals. At the climate change summit in September, Williams noted the decision by the U.S. Army Corps of Engineers and other federal agencies to temporarily halt work on the Dakota Access Pipeline after months of protests at the Standing Rock Sioux reservation. He said that was recognition that regulators were out of alignment with the Obama Administration’s agenda. While a court has allowed some of that work to start up again, the government’s order came with an announcement that the federal government would consult with tribes on major infrastructure projects in the future. The consultation process already existed since President Obama created a cabinet-level position to coordinate government-tribal relations, Anderson said. “Here the Obama Administration seems to be signaling that, ‘Hey, maybe we ought to be doing more,’” he said. That may lead simply to more federal agencies talking to each other and more often with tribal governments, which is still a step forward. From the Tulalip research boat, Williams pointed out a section of Hermosa Point where he’s lived since the 1970s. Here too, the bluffs have slid, and some of the houses are perched on the edge, hanging over the lip. “When I bought my house we were looking at getting closer to the bluff, but decided that wasn’t a good idea,” he said. If stronger regulations are enacted, it would prevent some houses from being built, and that would translate into lower insurance costs for government. That would also help protect fragile ecosystems. “The more we can understand it, the better we can prepare,” Williams said. Grays Harbor County is the vacation destination for Washingtonians who are looking for a relaxing affordable getaway. Grays Harbor is the home to popular beach towns like Ocean Shores, Seabrook, and Westport. Hikers and nature lovers who visit the Hoh Rainforest and Lake Quinault frequently admire the northern borders of the county because it shares the Olympic Peninsula with Jefferson and Clallam Counties. This county with breathtaking views almost everywhere you look is in danger of jeopardizing its greatest tourist attraction: it’s natural resources. Westway Terminal is seeking to build and operate oil terminals in Grays Harbor. The company wants to bring in large amounts of oil via train, store it on the shoreline, and ship it out of the harbor in tanker vessels. Westway is the third company attempting to bring crude oil business into the Grays Harbor community in recent years. Imperium Terminal Services and Grays Harbor Rail Terminal have both attempted and failed largely due to the communities’ opposition. Westway argues that the company will create thousands of job opportunities in a community that is economically struggling, and that Washington State has one of the best oil spill prevention and response teams in the country, so if a spill were to ever occur, the damage would be significantly less than other states. Grays Harbor recognizes the point the company is trying to make and although some citizens find the possibility of an economic boost appealing, the majority of Grays Harbor feel the risk is greater than the reward. The Quinault Indian Nation (QIN) is the most prominent among the many active voices in the community regarding this issue. 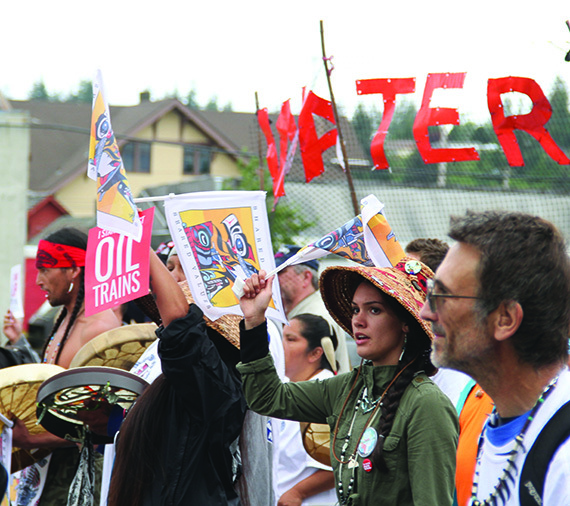 QIN hosted a march and rally in the city of Hoquiam on Friday July 8, protesting crude oil in Grays Harbor County. 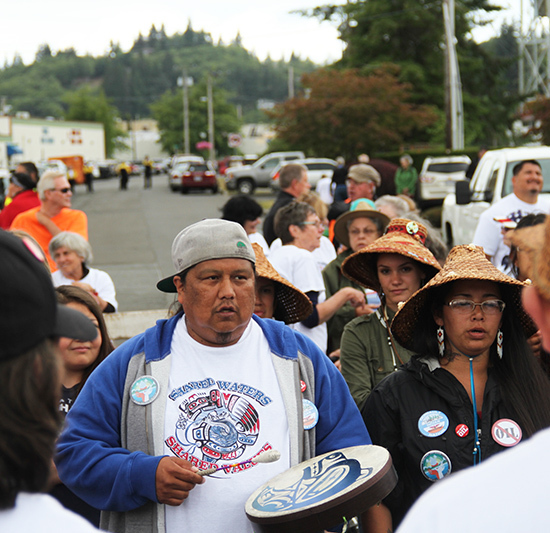 Hundreds of tribal and community members united in an effort to save the county from Westway’s purposed oil terminals. 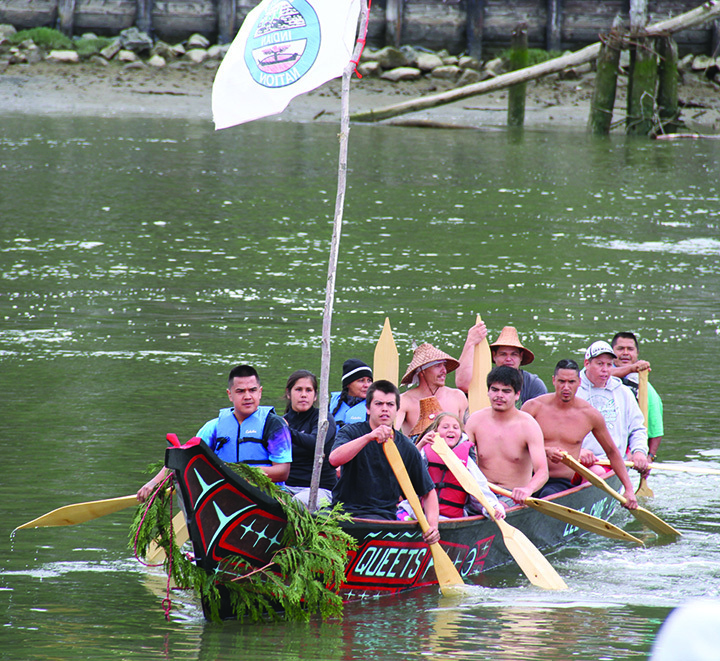 The rally began when traditional canoes docked at the Hoquiam River. 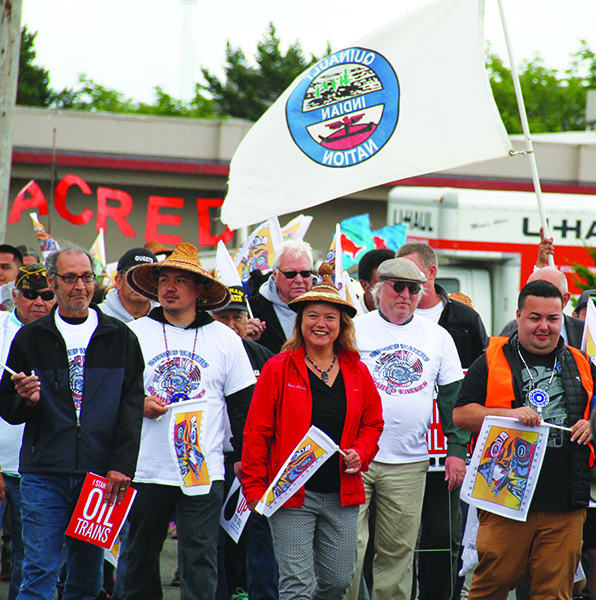 Once everybody was ashore the protesters, with banners raised high, marched onto Hoquiam City Hall. President Sharp commissioned an economic study in regards to what would happen to the community if the county approves the oil terminals. The study found that in the case of an oil spill, approximately 10,000 jobs would be threatened including 700 tribal fisherman, 400 non-tribal fisherman, and over 4,000 tourism based jobs. According to the study, more jobs would be lost in the community in the event of a spill than the jobs that would be created by approving Westway’s move to the harbor. Not to mention the damage a spill would cause the environment. Several community leaders gave testimonies opposing Westway at Hoquiam City Hall that afternoon. Tribal leaders from Lummi, Neah Bay, and Quileute were in attendance to show support for Quinault. 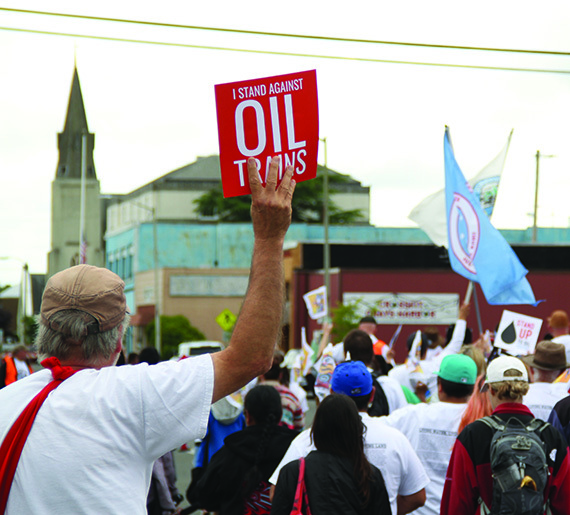 With the majority of the community on the same page, the purposed oil terminal seems to facing a losing battle. The QIN’s effort to preserve its natural resources for it’s future tribal members is a battle that the Nation is always prepared for. The protection of treaty rights is a fight that all tribes throughout Native America are familiar with, and when tribes stand together is when we are strongest. No crude oil! GOLD BAR — A 1.25-mile stretch of forested land along the Wallace River will now be protected forever as salmon habitat. The land, covering 121 acres on five parcels, was purchased by the environmental nonprofit Forterra in July for $490,000. Forterra, formerly known as the Cascade Land Conservancy, transferred the property to the Tulalip Tribes in November for future management. A conservation easement ensures the property will never be developed. “There’s a stewardship plan that we’ll be working on with the Tulalips” to maintain the tract’s value to the watershed, said Michelle Connor, Forterra’s executive vice president of strategic enterprises. The property on the north bank of the Wallace River consists of five parcels that are a mix of wetlands and mature second-growth forests. It was last logged several decades ago. “The trees have grown back nicely and the land is actually in pretty good shape,” said Daryl Williams, the Tulalip Tribes’ natural resources liaison. The tract is located just west of Gold Bar and close to the Mt. Baker-Snoqualmie National Forest, the Wild Sky Wilderness and other protected lands managed by the state Department of Natural Resources. The land lies across the Wallace River from a state salmon hatchery, and provides habitat for bull trout as well as four types of salmon: chinook, coho, pink and chum. The land is also home to black bear, elk, deer and beaver. Williams said the land is likely to remain in its present state, as it already provides ideal habitat for fish in the water as well as for land mammals. The deal came together when Forterra learned the owner of the parcels, a property investment firm called Robinett Holdings, soon would put them up for sale, Connor said. “When we first learned the property was coming on the market, we contacted the Tulalip Tribes to see if (the land) would be conservationally significant,” Connor said. That turned out to be the case, she said. “The property itself has historical oxbows and natural features that in and of themselves are very, very important,” she said. It also fit in with the Tulalips’ efforts to restore the watersheds associated with the Snohomish, Skykomish and Snoqualmie rivers. “We’ve been spending a lot of time and effort trying to restore areas on the watershed,” Williams said. The deal marks the second large habitat protection project the Tulalips have undertaken. Last year the tribes breached the levees and restored tidal influence to the Qwuloolt Estuary in Marysville. The 315-acre tract took 20 years to convert from farmland to a salt marsh and cost nearly $20 million. The transfer of the Wallace River tract is also consistent with Forterra’s goals in working with local Native American tribes on preservation, Connor said. Last year Forterra carried out a similar property transfer with the Makah Tribe involving 240 acres near Lake Ozette on the Olympic Peninsula that is considered critical salmon habitat. “We see that repatriation of indigenous lands is an important part of our conservation mission,” Connor said. Snohomish County was the primary provider of funds for the land purchase and transfer, providing $280,000 in Conservation Futures funds toward the purchase, and toward other costs associated with obtaining the conservation easements and transferring the property to the tribes. County Parks Director Tom Teigen said the Conservation Futures Advisory Board often tries to strike a balance between acquiring land for active recreation, agriculture and habitat preservation, but this particular exchange stood out for its potential benefits to salmon. “At the end of the day, preserving that property and getting that much acreage as well as the riverfront is significant,” Teigen said. Forterra also received $250,000 from the state Recreation and Conservation Office toward the property purchase. It has been 100 years since water flowed in this now former farmland along Ebey Slough. The place is unrecognizable from what it was just four months ago. “A lot of things are going to change really fast in here,” said Todd Zackey, as he and a team of researchers from the Tulalip Tribes navigated the waters Monday. In August, the Tulalip, along NOAA and Snohomish County breached a levee along the slough, flooding the land and returning its natural state. Now, researchers are casting nets into the water to see what fish are showing up. The goal is to create a salmon spawning habitat to help in increase their numbers around Puget Sound. 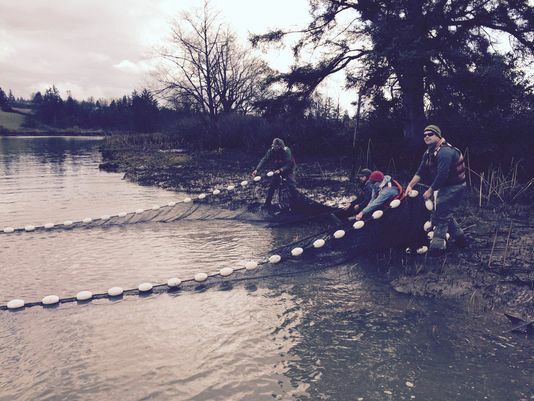 Researchers are casting nets into the Ebey Slough to see what fish are showing up. Right now, though, there are far more questions than answers. So far only a few salmon have been spotted, but that’s to be expected for this time of the year. There are plenty of other fish, though, and that’s a good sign. No one is in a hurry. This is a long term project. It will likely take a century for full restoration of these waters. And this project is about more than strengthening the fish supply. It’s about a way of life that goes back thousands of years for the Tulalip, and preserving that tradition for generations to come. Chinook born in the Nisqually River are being taken into protective custody by the Nisqually Indian Tribe. The tribe is trapping and spawning natural-origin chinook this fall because so few have returned in recent years. Instead of passing naturally produced chinook above a tribally operated weir, the tribe will truck them to its nearby Kalama Creek Hatchery. “We’re seeing a sharp decline of natural-origin chinook returning to the river, so we want to make sure these fish are as successful as they can be,” said David Troutt, natural resources director for the tribe. At Kalama Creek, the fish are being spawned by hand. Their offspring will be released into the river next spring. To make sure some chinook spawn in the wild, the tribe will release up to 600 adult hatchery-produced chinook into the upper watershed. That way, even more naturally produced chinook will leave the river next year. 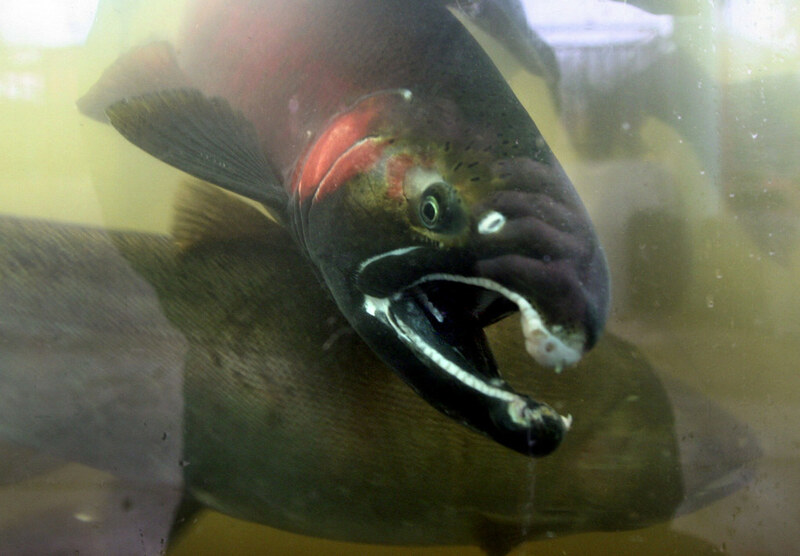 “The genetic difference between natural and hatchery-origin chinook on the Nisqually is small,” Troutt said. All of the chinook in the river are descendants from an imported hatchery stock planted decades ago. The native chinook stock was killed off in the 1960s in large part due to poor hydroelectric practices that left the river dry for months at a time. Five years ago, the tribe began closely managing the mix of natural and hatchery-spawned fish in the river to help mitigate hatchery influence on the stock. Recent declines in chinook productivity because of poor ocean conditions drove this year’s drastic action. “Instead of bringing in just a few, we need to bring in every single natural fish we can to protect them,” Troutt said. 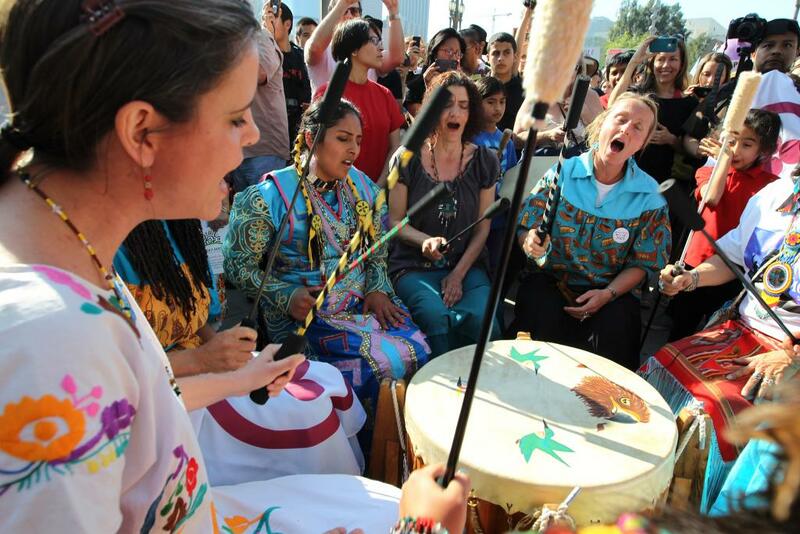 Native American drummers demonstrate at the steps of City Hall during a rally to take strong action on the climate change on February 17, 2013 in Los Angeles, California. NEW YORK — Not far from the negotiations for a new global development agenda that took place between heads of state at the United Nations General Assembly last month, a small group of female leaders gathered out of the limelight to sign another historic agreement. The delegation chose not to meet at UN headquarters in east Midtown but on a traditional Native American tribal territory in Central Park’s East Meadow. Seven women representing eight different tribes signed a treaty to unite the indigenous women of the Americas in friendship to protect the land and people from the harms of climate change and environmental degradation. In what organizers said was the first-ever indigenous women’s treaty, the women pledged to support the rights of indigenous peoples, commit nonviolent acts of civil disobedience to protect the planet, and demand immediate changes to laws that have led to environmental destruction. “We’re saying this is the line. We’re done. The destruction stops now,” said Pennie Opal Plant, one of the treaty’s lead signers. The United Nations recognizes that women are more vulnerable to the effects of climate change because they constitute a majority of the world’s poor and are more dependent on natural resources for their livelihood. “Women’s role as central stakeholders is one of the most important, yet untold stories of climate change. If we are to have a fighting chance at restoring the health of the Earth and our communities, women’s experiences and knowledge must be brought to the forefront,” said Osprey Orielle Lake, the executive director of Women’s Earth and Climate Action Network (WECAN), at an event where the treaty was later presented. Opal Plant, who is of the Yaqui, Choctaw and Cherokee tribes, was instrumental in shaping the treaty. She grew up in the shadow of Chevron and Shell refineries in the eastern part of the San Francisco Bay Area, where she saw environmental degradation first-hand. She has organized nonviolent prayer walks in her home city led by Native American elders, but after connecting with other women during a gathering of nature rights advocates in Ecuador 2014, Opal Plant saw opportunity to launch a worldwide movement. She joined several other indigenous leaders from the US and Ecuador — Casey Camp-Horinek of the Ponca tribe, Patricia Gualinga Montalvo and Blanca Chancoso of the Kichwa, and Gloria Hilda Ushigua Santi of the Sápara. Montalvo played a large role in successfully fighting the Ecuadorian government in 2012 in a landmark Inter-American Court of Human Rights case, Sarayaku v. Ecuador, in which the Ecuadorian government was found guilty of rights violations after authorizing oil exploration on Sarayaku lands without prior consultation with the indigenous community. Opal Plant and her treaty co-signers presented their document at an event hosted by WECAN on Sept. 29, a Global Women’s Climate Justice Day of Action. Women are disproportionately impacted by climate change, and they are central to solutions, said Orielle Lake at the event. In the coming months, Opal Plant and her co-signers will create a website to expand the treaty beyond the Americas and allow other groups to sign online. In December, they plan to bring the treaty to COP21, the Paris Climate Conference, and hold another ceremony where more indigenous women leaders will join. In New York, WECAN also presented a Women’s Climate Declaration, which includes a demand to bring back atmospheric carbon dioxide concentrations to below 350 parts per million — which many scientists agree is a level that avoids catastrophic global warming — and an aim to ensure that women’s groups have access to funding to adapt to climate change that is already happening. The declaration already has garnered over 2 million signatures and will be delivered at COP21 later this year. Women comprise 20 million of the 26 million people estimated to have been displaced by climate change, according to a 2010 report by the Women’s Environmental Network. “I ask that as temperature rises, that we rise,” said Orielle Lake. So their next step was to try the real thing: Actual runoff, collected at NOAA’s Northwest Fisheries Science Centerfrom a downspout that drains a Highway 520 onramp near Montlake. 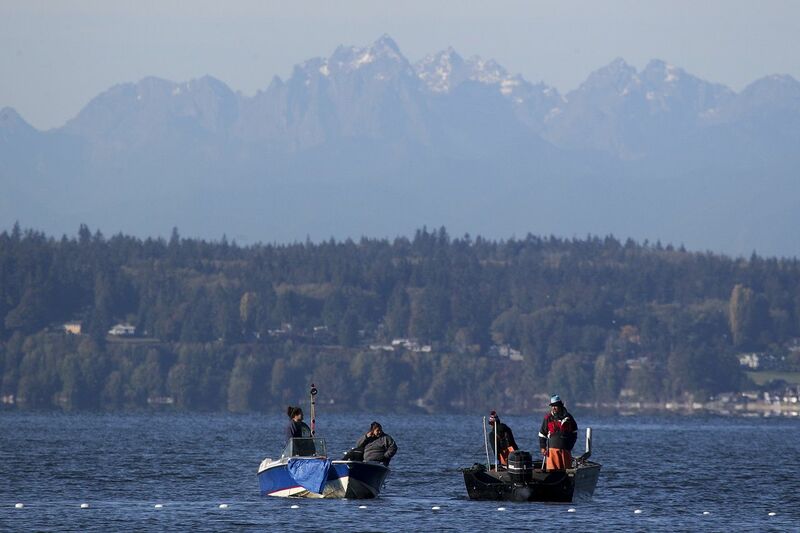 The Squaxin Island Tribe is working with the South Puget Sound Salmon Enhancement Group to restore vital forage fish habitat by removing a 70-foot-long boat basin and a 137-foot-long boat ramp to reconnect a large drift cell along the shoreline. “This kind of habitat, that forage fish use to spawn in, is critically important for deep South Sound,” said Scott Steltzner, salmon biologist for the Squaxin Island Tribe. A drift cell is a portion of shoreline that has a common source of sediment. When the habitat within these cells is disconnected, the actual amount of habitat available to forage fish can shrink. The boat basin takes the form of a perpendicular cut into the beach near the mouth of Hammersly Inlet. Ten foot high walls were designed to protect a resident’s boat from the surf and tide and the boat ramp provided access to Puget Sound, but they also cause a lot of problems for what salmon like to eat. 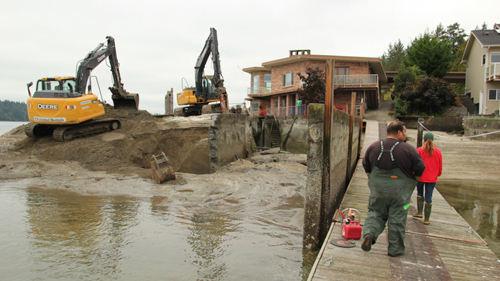 After removing the concrete boat basin and ramp, the Tribe will restore the original slope of the beach, recovering the spawning habitat lost to forage fish This will allow sediment to naturally move supplying sediment to beach spawning forage fish and those off shore. In addition to providing more room for forage fish, nearshore habitat also provides important rearing areas for juvenile salmon before they move out to the open ocean. Nearshore habitat is a productive swath of land close in to the coast that serves an important role in the life-cycle of salmon. MARYSVILLE — The levee at the Qwuloolt Estuary has been breached for nearly a month and the ecosystem is slowly transforming from a weed-covered lowland into a salt marsh. With the Tulalip Tribes doing the last bits of finishing work, the city of Marysville is now looking at its next big project: building 1.8 miles of new trail around the new estuary. The city is planning a 12-foot wide paved trail that would lead from Ebey Waterfront Park down to the estuary. Another segment will run on the east side of the breached levee up to Harborview Park in the Sunnyside neighborhood. If all goes according to plan, the two segments of trail would be complete by the end of 2016. It’s a big deal for the city, which has relatively little in the way of publicly available waterfront. “We’ve only had about 900 feet of access to our shoreline and this will change that significantly,” said Jim Ballew, Marysville’s director of Parks and Recreation. The project is estimated to cost between $1 million and $1.2 million, $500,000 of which was in the most recent budget from the Legislature. That also meant that the city’s trail project was delayed due to the extended budget debates in Olympia this year. The original plan was to have the western segment of the trail done by the end of the year. “We had to wait for the Legislature to approve the funding, and that was so delayed this year that we don’t even have a contract yet,” Ballew said. The rest of the trail’s funding includes a $347,000 grant from the state’s Aquatic Lands Enhancement Account, which will require the city to put up matching funds. 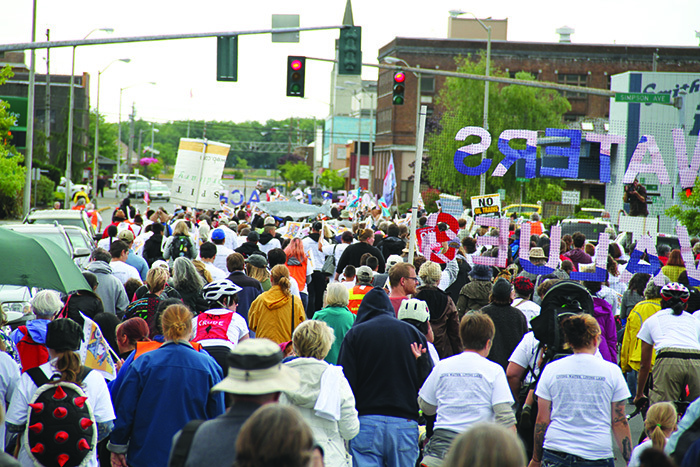 “We’ve got it within our capital budget; it’s ready to go,” Ballew said. The new plan calls for finishing the design work by the end of the year and expanding the project to include not just the trail, but other waterfront improvements and interpretive signs along the route. Further out, the plans will include the eventual construction of a mile-long loop around the estuary connecting the trail’s west and east legs. Funding so far only exists for the initial segments, meaning there will be a gap in the trail until some time in the future. The Qwuloolt Estuary restoration project is intended to create better habitat in the Snohomish River watershed for migratory salmon, especially juveniles that need a place to mature for up to a year or two while they gradually get used to a marine environment. The Tulalip Tribes have spent $20 million over 20 years on the estuary, with the final levee breach taking place Aug. 28. All that’s left now is to seal off the former tide gates and dig a final stormwater pond, said Josh Meidav, a restoration ecologist with the Tulalip Tribes. So far, Meidav said, the results of the levee breach have met their expectations. “The channel itself at low tide or incoming tide is actually capturing a good amount of the Ebey Slough inflow,” he said. Some marine fish have been seen in the upper reaches of the estuary and the reed canary grass is starting to die off, Meidav said. The city plans to reach out to the scientific community, the tribes and even the birdwatching community to provide input into the interpretive elements of the trail. “We’ll be spending a lot of time with those specialists,” Ballew said.